So what’s a Jawbone Up 24? Jawbone is a company that creates all kinds of cool tech products. Earlier in the week, we wrote about its new bluetooth headset, the Era, and chances are you’ll recognise its colourful little Jambox speakers too. But Jawbone has also been one of the first companies to really get stuck in when it comes to wearables, and its first activity tracking device, the Jawbone Up, proved to be a success and just about held its own against competitors, like the Fitbit Flex and the Nike+ Fuelband. The big problem with the Jawbone Up was that it didn’t support wireless activity tracking. Without a screen on the device, this meant that to get any data about your day – from how you sleep, to how many steps you’ve taken – you had to plug the device in to your phone. Doesn’t sound THAT irritating, right? Wrong. It really is if you plan on using the device everyday and meant it always came at the bottom of lists about which tracker you should buy despite all of its other great features. Well Jawbone appears to have listened to these criticisms, and in the last month the new Jawbone Up 24 has been released globally. It’s main difference? It wirelessly syncs data through to your smartphone via Bluetooth. Now this does mean you sacrifice some battery life, the original Up could last a whole ten days and the Up24 manages seven, but it’s now ready to contend with a slew of other new gadgets to be the best fitness tracking device on the market. So, we were really excited to put it to the test for a few weeks. The Up24 comes with sleep tracking, this means you wear it throughout the night and in the morning you’re served up with data about how you slept, including the amount of sound sleep you got, the amount of light sleep you got, the time it took you to fall asleep and how many times you woke up throughout the night. 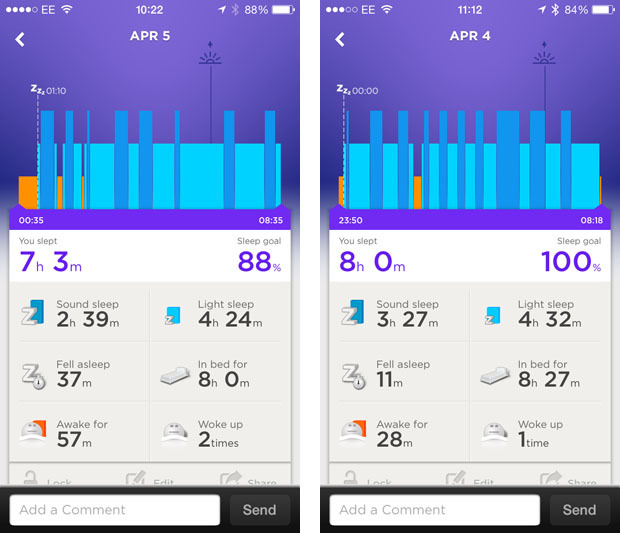 That sounds like a lot of information, but it’s all presented within the Jawbone Up app in a basic bar chart – the high bars are when you slept well, the lower ones are when you were tossing and turning and the really low orange ones are when you were wide awake. The Up24 also tracks your activity throughout the day, too. This data is presented in a similar way to your night time activity, you see a basic graph charting your day, the tall red bars are when you managed to walk or workout, the lower ones are your lower levels of activity and no bar at all is probably when you’re sat at your desk, wasting away. For both your sleep and your activity during the day, the Up24 prompts you to set yourself some targets, which works on the tried and tested idea that you’re more likely to keep moving and work on self improvement if you have something to aim for. Start off with the basic, suggested targets, which are 10,000 steps a day and 8 hours of sleep a night. You’ll be told how far off your goals you are each day and can reset them if you find them a little too hard to stick to (or farrrr too easy!). The original Up tracked your sleep and daytime activity and allowed you to set goals too, but the Up24 aims to be more of a coach than just a passive tracker, as it presents you with reminders to hit your daily goals and tells you ways in which you could be more awesome. If you’re wondering how it manages to do all of this, the Up24 comes with a built-in motion sensor and teams the data it gathers from that up with its own algorithms in order to passively track and quantify your steps, distance, calories, active time, and idle time throughout the day and night. Unfortunately the band can’t distinguish between different kinds of activity. If you’re doing something that isn’t step-based, then you can use its only button to start and stop a timer, enabling you to then go and fill in the workout you did via the app later. This is great if you want to keep a strict eye on your fitness levels and calorie burn, but for me it was enough to just let the app track I’ve moved a lot, rather than tell it exactly what I’ve done. How does it look and is it REALLY comfy? When you’re choosing an activity tracker, or any other kind of wearable, no one is ever going to judge you for being a little bit shallow and agonising over how it looks. You’re going to be wearing this thing every second of every day. That doesn’t mean you throw its features and tech specs out of the window, but it does mean the look and feel is just as important. The Jawbone Up24 has a soft, non-latex rubber exterior. Jawbone shouts about the fact this material is medical-grade and hypoallergenic, which sounds like boring sales speak, but is actually pretty important given the Fitbit Force’s recent recall. So we know the material is as comfy and kind to the skin as it can be and at only 20g – the Fitbit Force and Nike+ Fuelband are 30g – it’s one of the lightest options too. In all honesty, it feels awkward when you first put it on, especially during the first night. But after a day I got used to having it on my wrist and totally forgot it was there. There are some nights that I’ve not been able to sleep, so took it off thinking it was irritating me, but during the day it’s not a problem at all. Now let’s move onto the design, the Jawbone Up24 only comes in a bright orange/red or black, which is a little limiting considering the original Up came in a few more bright colours as well as a very subtle and very wearable grey. Having said that, both the black and the red are very bold and they look great with my workout gear. It’d just be good to introduce a shade that’s a little more subtle, flattering and wearable further down the line. The band comes in small, medium and large sizes. I’m not a tiny person, but definitely needed the small. If you’re not sure how big your wrist is, the packs the bands come in have size guides attached and if you’re buying online you can print one out too. Many other reviews have called the band “super stylish” and “beautiful”, which seems a little OTT. But if you’re comparing it to some of the other trackers that look like those bands you get at swimming pools to keep your locker keys safe, then it probably does win in the style stakes. Look at the photos and you’ll see I wear it with the silver ends facing upwards. At The Gadget Show earlier in the week someone told me this was the wrong way to wear it, but I don’t really care because wear it the other way and it looks like I’ve got a lame kid’s snap bracelet thing on. So I’d rather be wrong. But thanks for the advice random critical man! One thing you’ll notice about the Up24 in comparison to other fitness trackers on the market – like the Garmin Vivofit, the Fitbit Force and Flex and the Nike+ Fuelband – is that there’s no screen. At first I found this really appealing. I like the idea of passively tracking my day and only viewing stats as and when it suits me. However, the more I got into wearing the band and thinking about my movements and activity throughout the day, the more I kept looking at it, expecting it to give me something. ANYTHING! This was especially the case when I went for a run and wanted to see how I was doing without having to rely on another band or app to serve up data. The only thing you get on the band itself is a button that you can press to switch between day and night mode or use to set alarms. There’s also a cap that covers up a 2.5mm jack in order to charge the UP24. An adapter makes this work for USB, so you can plug it into your computer, but it feels a little clunky and annoying to have to carry something else around with you. But given the fact it only needs a charge once a week it’s not a deal-breaker. The Jawbone Up app dashboard is as slick as ever with rich colours and an intuitive interface, but the great thing is you can do as much or as little as you want with it. As you can see from the screenshots above, it serves up your daily activity and sleep activity in the form of handy charts, as well as little goals and tips. This was enough for me, as I’m only interested in getting fitter and increasing my activity levels. However, if you want to lose weight and watch your calories then you can then delve deeper into nutrition and the Up24 band and app will provide you with a more holistic approach to a healthy lifestyle. You can enter every little morsel you eat into the app, by taking a photo of it, scanning a barcode, searching for it in its extensive database or just adding in the details manually. The UP app then calculates calories burned based on your age, gender, height and weight, along with activity intensity and duration. The app is also where you can track details about how your band is doing, including how many days worth of battery there is left, whether you want to take a power nap and whether you want to set up alerts to vibrate you out of being idle! One of my favourite features of the app is also a Lifeline, which looks visually stunning, but also paints an accurate picture of how you’re doing over the course of the weeks or months you’ve been wearing the band for. The Trends tab does a similar thing, but presents your data in a simpler bar chart, so you can identify trends and change or improve on them if they’re not so great. There’s no web app yet, which doesn’t bother me at all, but I know other people do prefer to access this kind of data on the web, so it’d be good if Jawbone introduced a web dashboard soon. 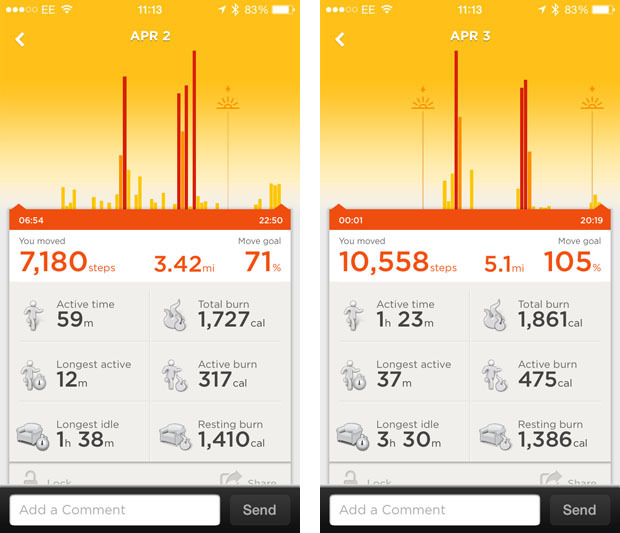 The Jawbone Up24 isn’t a perfect tracking device. Its charging functionality could be better, the colours might be a little jarring for some and its lack of a screen might put people off who a) need constant motivation or b) are really keen on tracking what’s going on throughout the day without having to rely on other pieces of tech. However, if you want an easy-to-use device that’ll fit into your lifestyle because it looks good, feels comfy and allows you to passively track your activity, as well as get stuck in and smash goals if you’re feeling enthusiastic, then the Jawbone Up24 is the best band on the market. Everyone can benefit from using it, but it’s best for those who want to get more active, sleep better or lose weight and like to see a range of different stats about their day and night activity. More serious athletes and those in training may not find it comprehensive enough. Equally, those who are after a simpler gadget and are a little freaked out by the idea of logging and tracking EVERYTHING should try a souped up pedometer like the Fitbit Zip to start with instead. The Jawbone Up24 is perfect for us because it’s comfy, looks good, wirelessly syncs our data and lets us get as involved as we want depending on how pumped we feel each day. Check out the Jawbone Up device compatibility list here. The Jawbone Up24 is available from John Lewis for £124.95. Can we take Imogen Heap and her magical, musical Mi.Mu gloves seriously?